Are you in the mood for Mexican or Italian? Serving up a home-cooked meal with ethnic flavor in less than 30 minutes IS possible. Save time and reduce waste with frozen foods! Numerous organizations, including the American Heart Association and American Cancer Society, recommend eating seafood twice a week. Frozen seafood products make that possible for everyone, year-round – not just during the fishing season or in areas local to fresh fishing. The flash-freezing process naturally locks in vitamins and minerals, with no impact to fat, protein or carbohydrates. 1.Prepare Gorton’s Smart & Crunchy Fish Fillets according to package instructions. 2.While fish fillets are cooking, chop lettuce, tomatoes, and avocados and place in bowl. 3.Sprinkle on black beans, tortilla strips, and any other topping of choice. 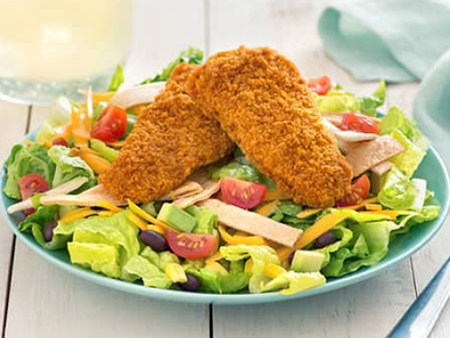 4.When fish fillets are done cooking, place 4 fillets on top of prepared salad. Serve topped with favorite dressing or salsa. 1.Heat oil in a large non-stick skillet over medium-high heat for 2 minutes. Then, sauté peppers, onions and mushrooms for 5-8 minutes. 2.Combine with the tomatoes and seasonings. Bring to a boil and reduce heat to medium. 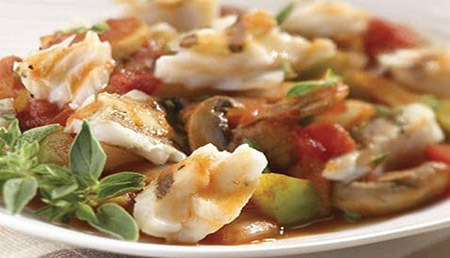 Top with your favorite flavor of Gorton’s All Natural Grilled Fillets, then simmer 10 minutes. Break up the fish, stir, and simmer 5 minutes more. Serve immediately.